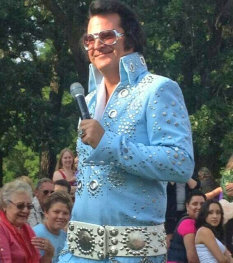 Search "Chris Olson Elvis Tribute"
on YouTube for more videos! Private Party and Special Event bookings are also welcome. to arrange your private or public booking. All welcome to the show, free of charge. "Memories of Elvis Tribute Show "
for the 25th Consecutive Season! 4th of July Week with Elvis! "Memories of Elvis Show "
for the 24th Consecutive Season! 3 Hour themed cruise with buffet dinner. Start the 2019 Labor Day Weekend with Elvis! Don't Miss Your Last Chance to see the Memories of Elvis Tribute Show at Breezy Point for the 2019 Season. Join friends, family, and neighbors in welcoming back White Bear Lake's own Chris Olson. for your private parties and special events! Call 612-860-6078 or email to book your event. Book The Memories of Elvis Tribute Show for your next event! Facebook group for special updates.